by Martin Malden on 3 November, 2009. Last updated on 29 January, 2018. I see a lot of questions asking how to make a WordPress post sticky. A sticky post is one that stays on the front page of your blog so that, same as sticky posts in forums, it will always be displaid first. It depends on the content of your blog, but any post you want everyone to read would qualify. It could be your commenting policy, directions for how to achieve something on your site or notice of an important upcoming event. Featured posts are driven by your theme and, depending on your theme’s functionality, you can set criteria in your control panel that will enable it to define which posts should be featured. Featured posts could change automatically as different posts meet (or fall short of) your criteria. 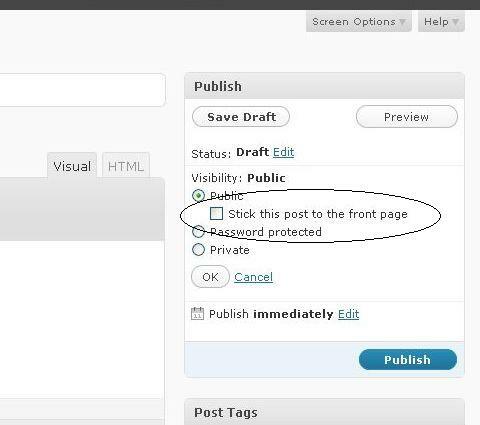 Sticky posts in WordPress are simpler, and driven by WordPress rather than your theme. You flag a post as sticky and it will stay on your front page until you remove the sticky flag. 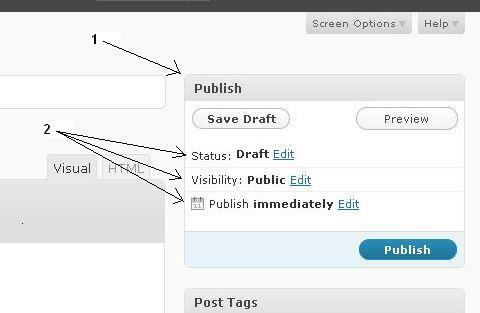 Inside the publish box are 3 factors you can edit: status, visibility and publish (2 above). If you click the edit link next to ‘visibility’ the rows below it will expand. Under the first option (public) is a sub option: ‘Stick this post to the front page’. Click the check box to make the post sticky and it will be stuck to the front page of your blog until you uncheck that box again. That’s all there is to it – no need for plugins or anything more complex. Do you recommend using sticky posts or static pages? I am not currently using either one, but I have some things that I would like to make permanent. I need to add an about me page, but I would also like to post policies on advertising and comments. I was thinking of adding pages for each. What’s your opinion? .-= Brad Harmon´s last blog ..Please Excuse the Mess =-. I agree – I’d use pages for those. As pages they’d be in your menu and, therefore, visible from everywhere on your blog. A sticky post will only be visible on the front page of your blog. Thanks Martin for the tip. Do you know how make “announcement messages” before the blog posts? .-= Mike´s last blog ..WooThemes Themes Giveway Contest from WPThemes.com =-. I think by ‘announcement messages’ you’re referring to the greeting that appears when you first land on one of my pages – is that right? The one in the box with the beige background? If so, that’s done by a plugin – the one I use is WP-Greet-Box which I reviewed here. If I’ve misunderstood let me know!